The Anti-Development State / The Political Economy Of Permanent Crisis In The Philippines; by Walden Bello, professor of sociology and public policy at the University of the Philippines in Quezon City . Co-authors Herbert Docena, Marissa Guzman, and Marylou Malign. Published in 2004 by the Department of Sociology, College Of Social Sciences And Philosophy, University Of The Philippines; and Focus on the Global South, a program of development policy research, analysis and action. I bought the book at National Book Store in Ayala Mall here in Cebu. Outside the Philippines, get it here. This is by far the best book that I've read about the current economic and political situation in the Philippines. In a nutshell, the authors ascribe the failure of economic development in the Philippines to the state (government) having been disempowered by the elites; hence the title, "The Anti-Development State"; and that what is needed is for development is not less, but more state. Introduction: Requiem for the EDSA System? The "EDSA system" refers to the current system of governance in the Philippines, put in place following the overthrow of Ferdinand Marcos in 1986. The state has failed to deliver positive economic or social change during this period, and thus is probably in a "terminal state." 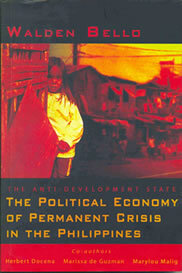 Ch 1: The Political Economy of Permanent Crisis. The authors suggest that there really has been no fundamental change in the Philippines since EDSA I, the "fundamental reality" being of an unchanging class structure with grossly inequitable income distribution. Rather, under the direction of international funding agencies such as the World Bank and the International Monetary Fund, successive Philippine governments during this period have focused on implementing neoliberal economic solutions, especially trade liberalization, deregulation, and privatization; which have done tremendous damage to the Philippine economy, society and environment. Ch 2: Agrarian Reform: The Promise and the Reality. This chapter tracks the sad history of land reform in the Philippines , which instead of being a centerpiece program to free millions of landless farmers from hundreds of years of servitude, has been a massive failure. The pattern was set by President Aquino, who trumpeted the importance of land reform but then refused to allow her own huge family estate (Hacienda Luisita, in Tarlac) to be included in the program. Ch 3: The Neoliberal Revolution and the Asian Financial Crisis. The authors show how the program of liberalization under President Ramos in the early 1990's left the economy vulnerable when the Asian Financial Crisis hit in 1997. Ch 4: Multilateral Punishment: The Philippines in the WTO, 1995-2003. The authors document how the Philippines was made to jump through painful hoops in order to join the World Trade Organization, thus exposing itself to free trade and monopolistic competition by the developed countries. In-depth analysis of the WTO agreement on agriculture (AOA) demonstrates how the US and the European Union demand that underdeveloped countries like the Philippines eliminate trade barriers and government subsidies while hypocritically continuing to use them to bolster their own agribusiness sectors. Ch 5: The Panacea of Privatization. Offers an excellent overview of the history of privatization around the world, and then provides two detailed Philippines case histories: the disastrous privatization of Manila 's Metropolitan Waterworks and Sewerage System (one of the biggest privatizations ever attempted in the world), and then the dismantling and privatization of NAPOCOR. Ch 6: Unsustainable Development. Sustainable development, which can be defined as "development that meets the needs of present generations without compromising the ability of future generations to meet their own needs," has been paid lip service by all recent administrations. The chapter uses two case studies (mining and forestry) to demonstrate how the Marcos, Aquino, Ramos, Estrada, and Arroyo administrations, kowtowing to the prevailing neoliberal framework of liberalization, have exacerbated the environmental crisis facing the Philippines. The chapter's central thesis is that corruption is wrongfully blamed for being the primary cause of failed economic development in the Philippines . The economic elites find "corruption discourse" a useful tactic, because it allows them to keep the public's attention focused on corruption rather looking at the real source of poverty in the Philippines . From the book: "The more convincing explanation for the country's poverty and underdevelopment lies more with the ruling elite factions control over people, production, markets, and resources and the successful subordination of the state to their interests. The country has failed to develop and so many of its people are mired in poverty because the state, strangled it is by competing factions' demands, has been rendered too powerless to even chart the country's direction, much less subordinate ruling elites under its control. Further sapping the state's potential to act according to democratic and development lines have been external interests constraining its range of allowable actions in the larger context of the North's persistent and often successful efforts to subordinate the South." 1. Reforming the system of governance through a constitutional convention. 1. More state: what is needed for development is not less, but more state. 2. Focusing on the internal market as the driver of development. The corollary of this would be massive income redistribution to create more consumers with purchasing power. 3. Development of a strategic national development policy, including using a flexible tariff policy to protect fledgling national industries from cheap imports, coupled with investment incentives and state-sponsored technological development. 4. Taking sustainable development seriously by adopting lower, sustainable growth rates, reinvigoration of agriculture, greening of manufacturing technology, and central leadership for the strategic planning process coupled with decentralized, sustainable production in key areas like agriculture. 5. Development in a regional context: coordinating the Philippines ' national development strategy with those of its neighbors. 6. Transforming the system of global economic governance, which is today dominated by the powerful developed countries. "The aim is to create space in the global economy for developing countries like the Philippines to put together unique strategies for development that respond to their values and rhythms as societies, something that is currently not possible owing to the one-size fits-all neoliberal model promoted by the IMF-World Bank-WTO complex."